I have never been a fan of non-gel ballpoints; the ink is generally inconsistent and not particularly vivid. I have received ballpoints as gifts on a number of occasions and on a pen blog it would be wrong to ignore them. The S.T. 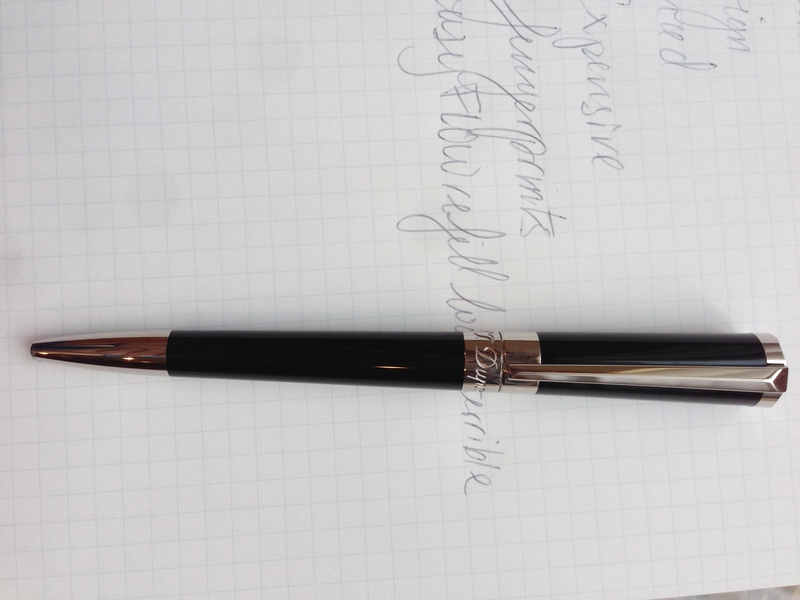 Dupont Liberté ballpoint is made from a brass barrel finished in black lacquer (not the more expensive Chinese lacquer S.T. Dupont is famous for) with palladium accents. The tapered design is elegant and the top of the cap its faceted with “D” in metal. Even though this is a lower end model for S.T. Dupont it still costs a whopping $480 retail. The Liberté is a fingerprint magnet and that drives me nuts but the fit and finish is exceptional. The Liberté weighs in at 1.16oz which makes it a heavier pen but in my hand it is incredibly well balanced. 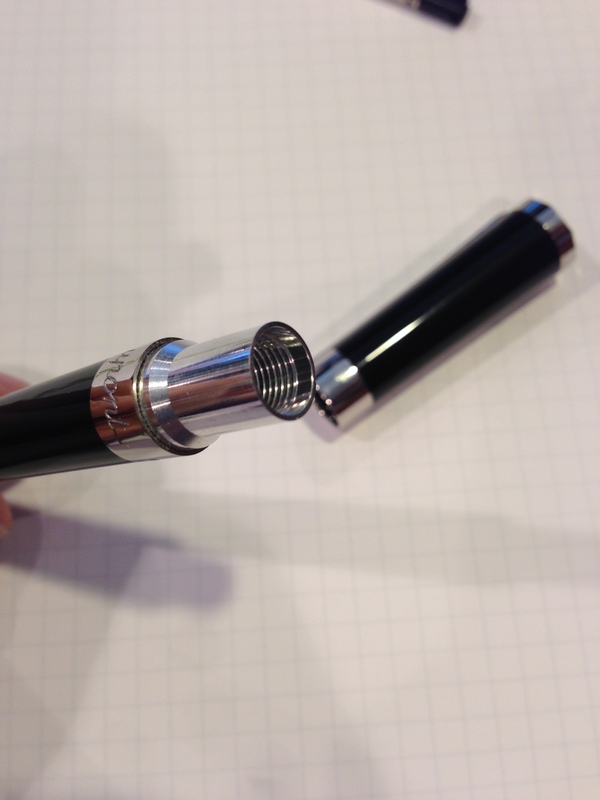 The body of the pen attaches to the cap with threading on the INSIDE of the barrel (see below). To deploy and retract the ballpoint you simply twist the pen. The twist mechanism is both very smooth and very crisp. 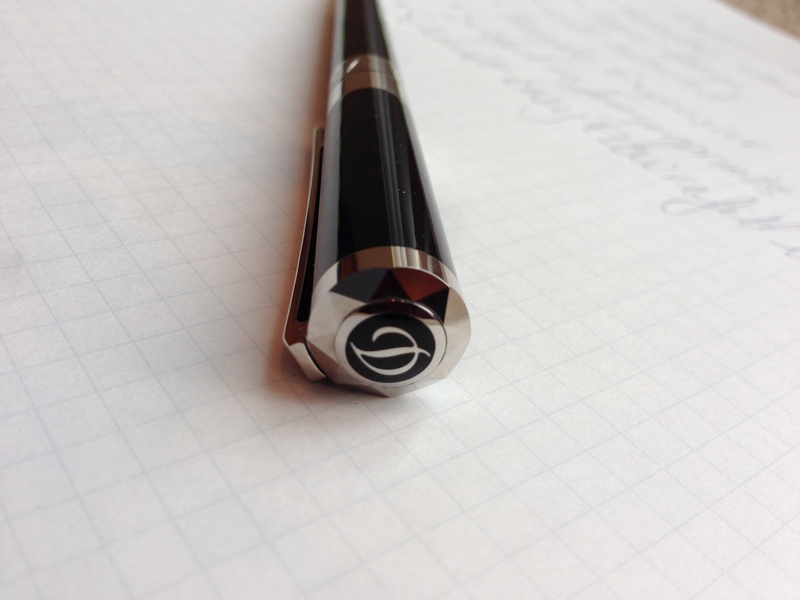 The ballpoint is an S.T. Dupont branded EasyFLOW Schmidt refill that is unusually smooth. It is so smooth in fact that I felt inclined to write in my normal cursive-esque hand. Unfortunately the look of the ink is unusually hideous. The easyFLOW refill always starts up without delay which is nice but when the ink looks this washed out and faint who really cares? With a better refill The S.T. 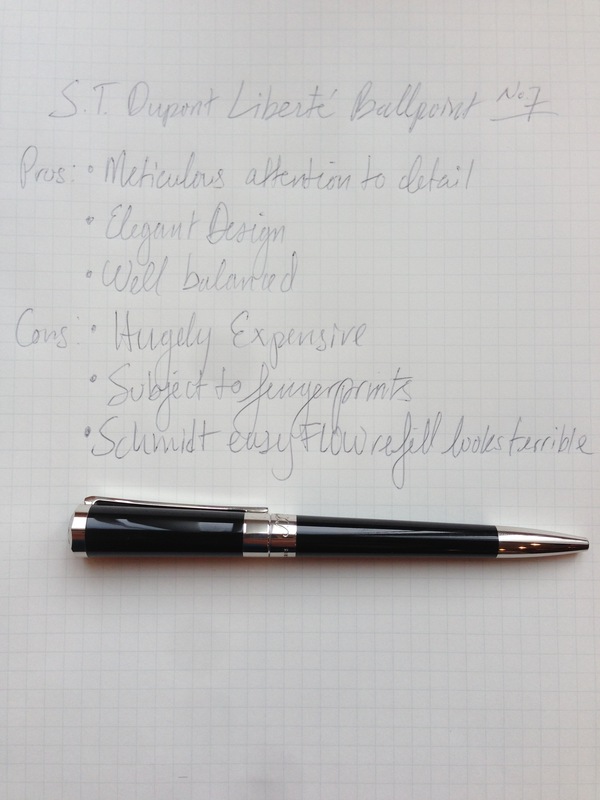 Dupont Liberté would be a great ballpoint pen that quality-wise is superior to many pens in the same price-range (the modern version of the Montblanc Meisterstück and the Cartier Diabolo come to mind).